DIE Saturni, 26 die Aprilis. Workmens Petition for Money due for Repair of St. Paul's. Hobson's Kindred, Poor of Buntingford, Bennet, Caesterton, &c. versus Rose, Executor to Hobson. Assessors in Herts sent for, for assessing the E. of Salisbury. Message from the H. C. with Ordinances. Sir Anthony St. Johns to be recommended to the H. C. for a Subsistence. Colonel West recommended by the Lord Mayor, &c. to be Lieutenant of The Tower. Answer to the L. Mayor, &c.
Report concerning the Cause of Colonel Keyes's Imprisonment. Edwards, E. of Suffolk's Servant, to be released by the Committee of Shropshire. to be published; and all Commanders, Governors, &c. to see it put in Execution. Ordinance to raise 2300l. for Colonel Massey. Ordinance to secure 10,000l. to the Merchants Adventurers, who have agreed to withhold the Payment of it Nine Months longer. Order for the Commissioners of Excise to re-pay themselves 500l. advanced to the L. General's Life-guard. E. of Pembroke's Estate in Essex discharged of the Assessment of 50l. laid by the Commissioners there. E. of Salisbury's Causes against Harrow & al. stayed. Upon reading the Petition of the Workmen lately employed for repairing Paul's Church in London; shewing, "That there are divers Sums of Money due to them, for Work done to the said Church; they desire that some Part of the Materials may be put to Sale, that thereby the Petitioners' great Necessity may be relieved." It is Ordered, That Mr. Carter, Surveyor of the Work, shall have a Copy of this Petition, and certify to this (fn. 1) House what Monies are due to the Petitioners; and then this House will receive further Information from him concerning this Business. Upon reading the Petition of the poor Inhabitants of Bennett Parish in Camb. and of Chesterton, Waterbeach, and Cottenham, in the County of Camb. and of Buntingford, in the County of the Scholars of Buntingford, and of the poor Kindred of Thomas Hobson, late of Camb. Carrier, deceased; complaining, "That Thomas Hobson gave great Legacies to the Petitioners, and left Christopher Rose sole Executor, who hath, contrary to the Trust reposed him, converted the Estate to his own Use." Hereupon this House Ordered, That this House refers the Business to the Commissioners of the Great Seal of England, to give them Relief in Chancery. Upon Information to this House, by the Earl of Sarum, "That he is assessed in the County of Hertford, for finding of Arms, to set forth Soldiers; which is contrary to the Privileges of Peers." Hereupon this House Ordered, That Wm. Pratt, Richard Clarke, Wm. Carpenter, and George Hawkes, some of the Assessors, shall appear before this House, to give an Account by what Warrant they did it. 1. They have been informed, "That some Laymen, not being qualified by Orders, have presumed to preach in the Army and other Places;" therefore they have passed an Ordinance for the preventing the same, wherein they desire their Lordships Concurrence. 2. To desire Concurrence in an Ordinance for securing Monies, to be sent to the Supply of Colonel Massey. That this House agrees to all the Particulars now brought. 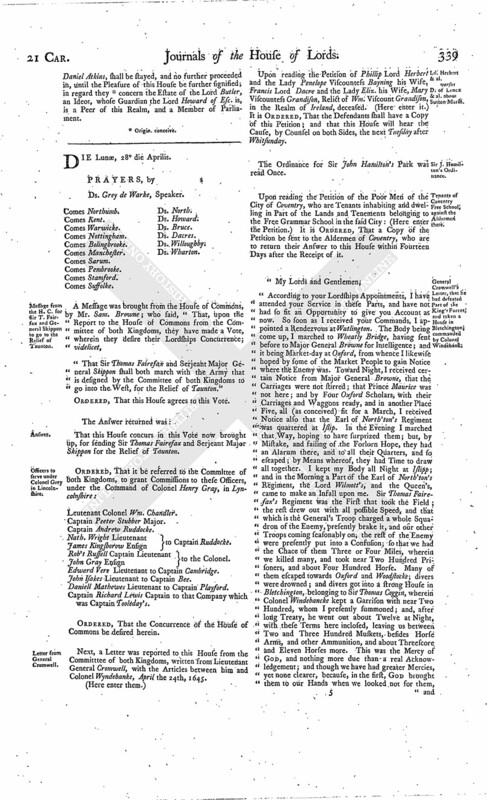 Ordered, That it be recommended to the House of Commons, by the next Message, that Sir Anthony St. Johns, who hath been employed in the Parliament's Army ever since the Beginning of the War, and hath been forward and faithful, and wounded in the said Service, and hath many Arrears for Pay due unto him, and who hath been specially recommended to this House by the Lord General upon the laying down his Commission; that they would take him into special Consideration, that he may be supplied with Monies, whereby he may be able to subsist. A Message was brought from the House of Commons, by Sir Rob't Pye Knight, &c.
This Day divers Aldermen and Common Council Men of the City of London came to the House; and Sir John Wollaston said, "They were commanded, by the Lord Mayor and Common Council of London, to return their Lordships great Thanks, for the Order sent to them, to give them Leave to think of a fit Person to present to the Consideration of both Houses, to be Lieutenant of The Tower of London; and they have presented to their Lordships Colonel Francis West, whose Faithfulness and Fidelity they have sufficiently tried; therefore they humbly desire their Lordships Acceptance of him, leaving it wholly to their Lordships Consideration." They being withdrawn; it is Ordered, That this House approves and accepts of Colonel Francis West, to be Lieutenant of The Tower of London. The Aldermen and Common Council were called in again; and the Speaker, by the Direction of this House, gave them this Answer: "That this House approves and accepts of Colonel Francis West, recommended now from the Lord Mayor and Aldermen and Common Council of the City of London, to be Lieutenant of The Tower; and that this House returns Thanks for their Recommendation of such a fit Person." Mr. Justice Bacon made Report of the Business concerning Colonel Keyes, referred to him; and a List of the Persons Names, and the Causes of the Actions brought against him, were read; and many were Actions for Reparation, for his plundering and taking away their Goods because they were well-affected. And the House was further informed of many Misdemeanors of the said Colonel Keyes. It is Ordered, That this House leaves him to the Law. Upon Information to this House, "That the Committee of Shropshire hath not released Thomas Edwards, Servant to the Earl of Suffolke, according to the Order of this House:" It is Ordered, That the said Thomas Edwards shall forthwith be released and set at Liberty; or else to send him, with a Certificate of the Cause, within Twelve Days after Receipt of this Order; the Earl of Suffolke will be ready to produce him at any Time when they shall send up any Complaint against him here. "It is this Day Ordained and Declared, by the Lords and Commons in Parliament assembled, That no Person be permitted to preach, who is not ordained a Minister, either in this or some other Reformed Church, except such as (intending the Miuistry) shall be allowed for the Trial of their Gifts, by those who shall be appointed thereunto by both Houses of Parliament. 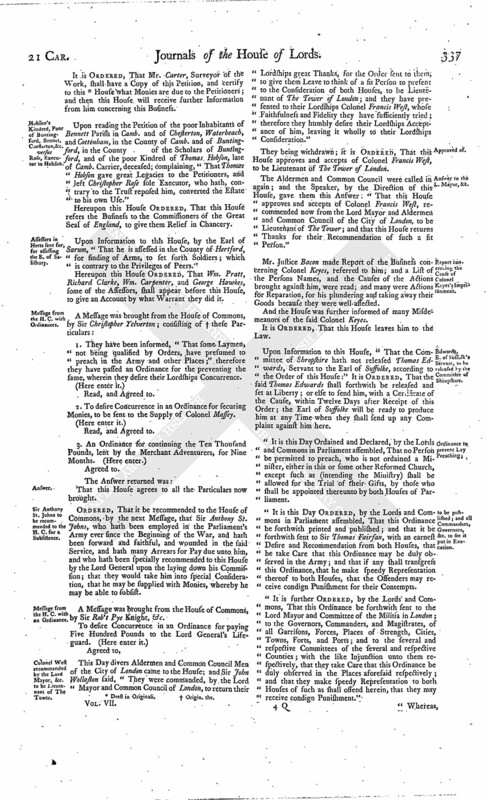 "It is this Day Ordered, by the Lords and Commons in Parliament assembled, That this Ordinance be forthwith printed and published; and that it be forthwith sent to Sir Thomas Fairfax, with an earnest Desire and Recommendation from both Houses, that he take Care that this Ordinance may be duly observed in the Army; and that if any shall transgress this Ordinance, that he make speedy Representation thereof to both Houses, that the Offenders may receive condign Punishment for their Contempts. 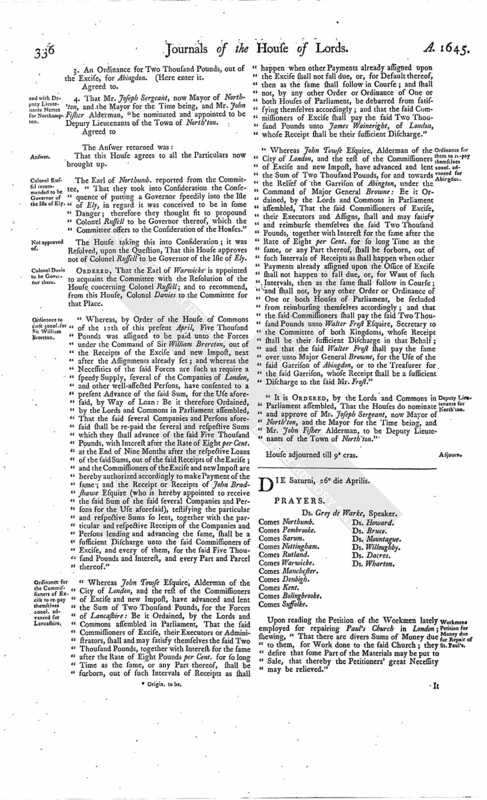 "It is further Ordered, by the Lords and Commons, That this Ordinance be forthwith sent to the Lord Mayor and Committee of the Militia in London; to the Governors, Commanders, and Magistrates, of all Garrisons, Forces, Places of Strength, Cities, Towns, Forts, and Ports; and to the several and respective Committees of the several and respective Counties; with the like Injunction unto them respectively, that they take Care that this Ordinance be duly observed in the Places aforesaid respectively; and that they make speedy Representation to both Houses of such as shall offend herein, that they may receive condign Punishment." 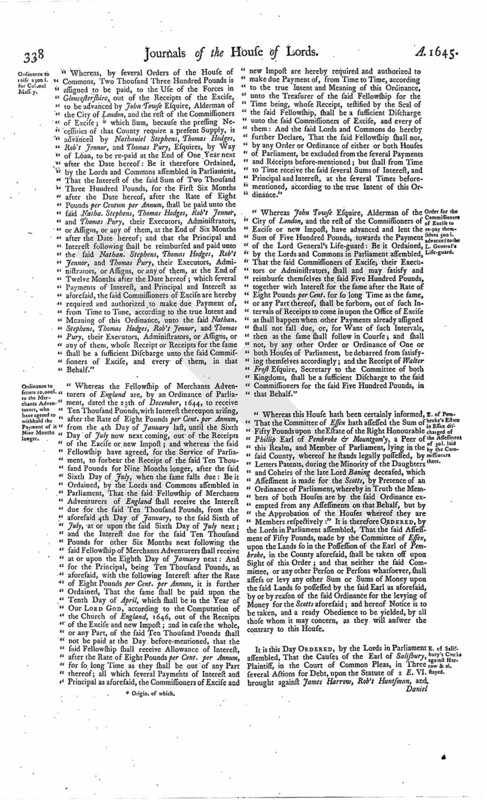 "Whereas, by several Orders of the House of Commons, Two Thousand Three Hundred Pounds is assigned to be paid, to the Use of the Forces in Gloucestershire, out of the Receipts of the Excise, to be advanced by John Towse Esquire, Alderman of the City of London, and the rest of the Commissioners of Excise; (fn. 3) which Sum, because the pressing Necessities of that County require a present Supply, is advanced by Nathaniel Stephens, Thomas Hodges, Rob't Jennor, and Thomas Pury, Esquires, by Way of Loan, to be re-paid at the End of One Year next after the Date hereof: Be it therefore Ordained, by the Lords and Commons assembled in Parliament, That the Interest of the said Sum of Two Thousand Three Hundred Pounds, for the First Six Months after the Date hereof, after the Rate of Eight Pounds per Centum per Annum, shall be paid unto the said Natha. Stephens, Thomas Hodges, Rob't Jennor, and Thomas Pury, their Executors, Administrators, or Assigns, or any of them, at the End of Six Months after the Date hereof; and that the Principal and Interest following shall be reimbursed and paid unto the said Nathan. Stephens, Thomas Hodges, Rob't Jennor, and Thomas Pury, their Executors, Administrators, or Assigns, or any of them, at the End of Twelve Months after the Date hereof; which several Payments of Interest, and Principal and Interest as aforesaid, the said Commissioners of Excise are hereby required and authorized to make due Payment of, from Time to Time, according to the true Intent and Meaning of this Ordinance, unto the said Nathan. Stephens, Thomas Hodges, Rob't Jennor, and Thomas Pury, their Executors, Administrators, or Assigns, or any of them, whose Receipt or Receipts for the same shall be a sufficient Discharge unto the said Commissioners of Excise, and every of them, in that Behalf." "Whereas the Fellowship of Merchants Adventurers of England are, by an Ordinance of Parliament, dated the 23th of December, 1644, to receive Ten Thousand Pounds, with Interest thereupon arising, after the Rate of Eight Pounds per Cent. per Annum, from the 4th Day of January last, until the Sixth Day of July now next coming, out of the Receipts of the Excise or new Impost; and whereas the said Fellowship have agreed, for the Service of Parliament, to forbear the Receipt of the said Ten Thousand Pounds for Nine Months longer, after the said Sixth Day of July, when the same falls due: Be it Ordained, by the Lords and Commons assembled in Parliament, That the said Fellowship of Merchants Adventurers of England shall receive the Interest due for the said Ten Thousand Pounds, from the aforesaid 4th Day of January, to the said Sixth of July, at or upon the said Sixth Day of July next; and the Interest due for the said Ten Thousand Pounds for other Six Months next following the said Fellowship of Merchants Adventurers shall receive at or upon the Eighth Day of January next: And for the Principal, being Ten Thousand Pounds, as aforesaid, with the following Interest after the Rate of Eight Pounds per Cent. per Annum, it is further Ordained, That the same shall be paid upon the Tenth Day of April, which shall be in the Year of Our Lord God, according to the Computation of the Church of England, 1646, out of the Receipts of the Excise and new Impost; and in case the whole, or any Part, of the said Ten Thousand Pounds shall not be paid at the Day before-mentioned, that the said Fellowship shall receive Allowance of Interest, after the Rate of Eight Pounds per Cent. per Annum, for so long Time as they shall be out of any Part thereof; all which several Payments of Interest and Principal as aforesaid, the Commissioners of Excise and new Impost are hereby required and authorized to make due Payment of, from Time to Time, according to the true Intent and Meaning of this Ordinance, unto the Treasurer of the said Fellowship for the Time being, whose Receipt, testified by the Seal of the said Fellowship, shall be a sufficient Discharge unto the said Commissioners of Excise, and every of them: And the said Lords and Commons do hereby further Declare, That the said Fellowship shall not, by any Order or Ordinance of either or both Houses of Parliament, be excluded from the several Payments and Receipts before-mentioned; but shall from Time to Time receive the said several Sums of Interest, and Principal and Interest, at the several Times beforementioned, according to the true Intent of this Ordinance." "Whereas John Towse Esquire, Alderman of the City of London, and the rest of the Commissioners of Excise or new Impost, have advanced and lent the Sum of Five Hundred Pounds, towards the Payment of the Lord General's Life-guard: Be it Ordained, by the Lords and Commons in Parliament assembled, That the said Commissioners of Excise, their Executors or Administrators, shall and may satisfy and reimburse themselves the said Five Hundred Pounds, together with Interest for the same after the Rate of Eight Pounds per Cent. for so long Time as the same, or any Part thereof, shall be forborn, out of such Intervals of Receipts to come in upon the Office of Excise as shall happen when other Payments already assigned shall not fall due, or, for Want of such Intervals, then as the same shall follow in Course; and shall not, by any other Order or Ordinance of One or both Houses of Parliament, be debarred from satisfying themselves accordingly; and the Receipt of Walter Frost Esquire, Secretary to the Committee of both Kingdoms, shall be a sufficient Discharge to the said Commissioners for the said Five Hundred Pounds, in that Behalf." "Whereas this House hath been certainly informed, That the Committee of Essex hath assessed the Sum of Fifty Pounds upon the Estate of the Right Honourable Phillip Earl of Pembroke & Mountgom'y, a Peer of this Realm, and Member of Parliament, lying in the said County, whereof he stands legally possessed, by Letters Patents, during the Minority of the Daughters and Coheirs of the late Lord Baning deceased, which Assessment is made for the Scotts, by Pretence of an Ordinance of Parliament, whereby in Truth the Members of both Houses are by the said Ordinance exempted from any Assessments on that Behalf, but by the Approbation of the Houses whereof they are Members respectively:" It is therefore Ordered, by the Lords in Parliament assembled, That the said Assessment of Fifty Pounds, made by the Committee of Essex, upon the Lands so in the Possession of the Earl of Pembroke, in the County aforesaid, shall be taken off upon Sight of this Order; and that neither the said Committee, or any other Person or Persons whatsoever, shall assess or levy any other Sum or Sums of Money upon the said Lands so possessed by the said Earl as aforesaid, by or by reason of the said Ordinance for the levying of Money for the Scotts aforesaid; and hereof Notice is to be taken, and a ready Obedience to be yielded, by all those whom it may concern, as they will answer the contrary to this House. It is this Day Ordered, by the Lords in Parliament assembled, That the Causes of the Earl of Salisbury, Plaintiff, in the Court of Common Pleas, in Three several Actions for Debt, upon the Statute of 2 E. VI. brought against James Harrow, Rob't Huntsman, and Daniel Atkins, shall be stayed, and no further proceeded in, until the Pleasure of this House be further signified; in regard they (fn. 4) concern the Estate of the Lord Butler, an Ideot, whose Guardian the Lord Howard of Esc. is, is a Peer of this Realm, and a Member of Parliament.